Do you know where your car’s timing belt is? Do you know what it does? Most people don’t but it’s a vital part of your car and once it breaks your car will simply stop. In its tracks. No matter where you are or where you’re headed. The timing belt controls, guess what, the timing of your engine. More specifically, the precise speed the camshaft turns. It may last for years, and usually does, but if you don’t check it now and then you could be in real trouble. 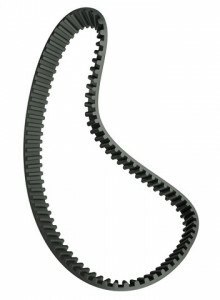 If your timing belt breaks your car will cease to move and this could be a problem if you’re on a busy street or highway. If your car is equipped with what’s called an interference engine that could mean real repair problems. An interference engine lacks good clearance between valves and pistons so when a timing belts breaks it could mean bent valves or a broken piston and that adds up to high repair bucks. Even a small slip in belt tension can mean pistons and valves might bang into each other and cause big damage. As your car ages your timing belt will crack, stretch and break due to engine wear, excessive heat, (remember this last summer?) the type of material it’s made of, dust or other contaminants. Check your owner’s manual for recommended mileage for replacement. Normally it’s around 60,000 miles but they can last far longer. Or not. Don’t neglect this inexpensive but vital part of your car’s engine. You’ll thank us later when your mechanic looks at your belt and turns white! Sallas Auto Repair can look over your timing belt to determine it’s condition and recommend a replacement if needed. Our ASE certified mechanics can keep your car (and you) on the road, safely and economically. We’re simply the best in town.